Access to the complete set of technical analysis tools: data, charting & scanner software. The groupware downloads your data, scans for opportunities based on your criteria & provides charting capabilities second to none. A powerful yet easy to use stock market data downloader used and recommended by expert ASX investors. This high-quality managed data will ensure you get the most out of your market transactions. Find out more about Bodhi! Professional-grade charting tools you can learn in hours. Analyse price data with a wide selection of standard and specialist indicators and drawing tools, and choose to use the pre-set parameters or your own. Browse through ASX Industry Sector charts and view values for prices and fundamentals. Find out more about EzyChart! Incredible market screener technology that saves time and advances a trader's ability. Scan sectors, groups or entire markets for buy and sell opportunities. Find out more about EzyAnalyser! Whether a novice or simply exploring new trading software, EzyStation is the answer for private investors needing a powerful yet affordable all-in-one solution for the short to medium-term. 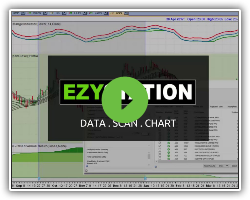 The great thing about an EzyStation lease is the full access you are granted to high-quality software designed specifically for private traders. It comes at a very competitive entry-level price for those wanting to have more control and educate themselves on investing. Watch the video below for a quick EzyStation walk through. EzyStation is available on annual lease and only operates with a Bodhi data subscription. You can choose from local or overseas stock exchanges such as the ASX, NASDAQ or NZE. And/or global currencies on the Forex, or current and continuous contracts from the SFE (Sydney Futures). For a full list of exchanges offered click here. When the EzyStation annual lease expires or lapses the software ceases to function unless renewed. If you want an open license to the software, consider EzyProfessional, which gives you access to the same tools for a one-time fee (you only need top-up your annual data subscription).